Hip + Joint for Small Dogs is an advanced hip and joint support formula containing high levels of glucosamine, MSM, and chondroitin sulfates. 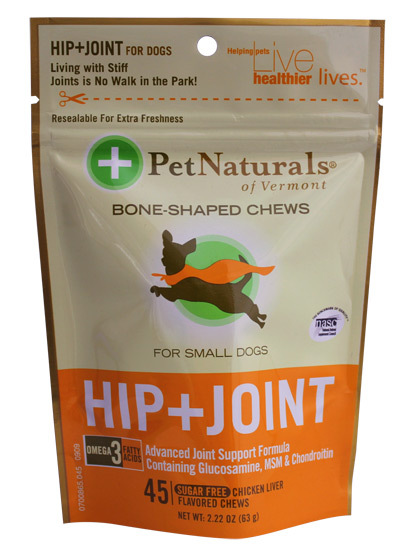 Hip + Joint contains a comprehensive combination of ingredients not found in ordinary hip and joint supplements for dogs up to 30 lbs. Glucosamine acts as a building block for tissues in tendons, ligaments, and cartilage, which is needed for the support of hip, joint, and connective tissue function and repair. Hip + Joint also features essential fatty acids and our patented DMG, which increases oxygen utilization in tissues, to support mobility. Hip + Joint for Small Dogs is available in a tasty, chicken liver flavor chew that dogs love. Up to 20 lbs: 2 chews daily. 21-30 lbs: 3 chews daily. Daily amount may be divided between AM and PM. For quicker results, double the recommended amounts above for the first 6 weeks. Inactive Ingredients: arabic gum, brewers yeast, calcium sulfate, chicken liver flavor, citric acid, corn oil, fish oil, glycerin, ground oat groats, ground rye groats, maltodextrin, mixed tocopherols, oat meal, pectin, propionic acid, rosemary extract, silicon dioxide, sodium alginate, sorbic acid, soy lecithin, vegetable oil, water. CAUTION: If lameness worsens, discontinue use and contact your veterinarian. CAUTION: Administer during or after the animal has eaten to reduce incidence of gastrointestinal upset. WARNING:Keep out of reach of children and animals. Your pet may consider this a treat. In case of accidental overdose, contact a health professional immediately.